When I think of this scripture it reminds me of some great Shonen Jump! 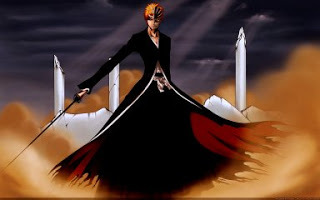 characters such as Ichigo Kurosaki from Bleach and Naruto Uzumaki from Naruto. Ichigo had power that was endowed to him from several factors. The power of a quincy from his mother and the power of soul reaper from his father. A power that only manifested itself by just being able to see ghost and spirits. Now you may be asking how this may be linked to the scripture above. When Ichigo’s family was in trouble and there was no one to save them except a lone soul reaper, Rukia Kuchiki. She activated his dormant soul reaper powers and was able to save his family. Just like Ichigo I believe God’s Holy Spirit that dwells inside of us all strengthens us when we need it the most. He gives us the will and courage to fight the battles we lack the strength to. But when it comes to Ichigo it gets better. Later on from those events he is threatened by a greater adversary and the strength that he thought was enough was not even close. He needed more strength and with the help of his mentor, Yoruichi Shihohin, he was able to achieve another level of power, Bankai. I thought about how our God will continuously grant us his strength and power for every battle and situation that comes to us. Please remember to keep the faith and know that God will strengthen you for every battle be it a hollow or sickness. Just pray and believe.